Dr. Zimmermann has been in chiropractic practice for 25 years. He is an honor graduate from New York Chiropractic College. He has extensive, advanced training in nutrition, muscle and soft tissue treatments as well as in the management of sports injuries. He also holds a B.S. degree in Biology and General Sciences from Cortland State University in New York and a Medical Technology Degree from St. Peter’s Hospital in Albany, NY. Dr. Zimmermann is a former science teacher at the high school and college levels. He was the Educational Coordinator at Cambridge Hospital School of Medical Technology in Cambridge, Massachusetts. In his role at Cambridge Hospital he instructed medical students and medical residents in laboratory science. 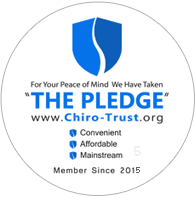 His strong commitment to education extends into his chiropractic practice through programs for patients on nutrition, exercise and chiropractic health care. We believe that knowledge can be empowering. The more we understand our bodies and the mechanisms that cause injuries, the more committed we become to getting better. Our office is devoted to educating you about your body, how it works and how to heal it. We believe in working with our patients as partners, to learn from each other in our journey together to maximize health.